Have you ever wanted to disappear? To drop everything in the blink of an eye and escape? To start afresh in a new, exotic locale? To step out of the rat race once and for all and truly experience the endless possibilities that the world has to offer? – To hell with the soul sapping nine to five, to hell with all the hollow, plastic technology that you have surrounded yourself with, to hell with the trivialities and mundane existence of day to day life – I know I have and I am sure you have, too. And that is exactly what the two main characters in Burrito Deluxe decided to do, and they never looked back. The hero of Burrito Deluxe is the eponymous Joseph Ridgwell, who along with his best mate Ronnie, decide to ditch their dead end life in the East End of London and hop on a flight bound for Mexico. For many middle class youngsters growing up in the UK, a no expense spared trip around the Americas paid for by the bank of mummy and daddy is a common occurrence, but for two working class council estate kids things don’t come so easy. Joseph and Ronnie have to beg, borrow and quite literally steal to gather together the capital that will necessitate their dreams. Their plan is to get enough cash together to see them by for a year in Central and South America before moving on to Australia to find work and continue their adventure. Of course, things don’t quite go to plan and once in Mexico their excessive lust for partying and the never ending search for the Lost Elation means they are soon running out of cash. Queue more hair brain get rich quick schemes as they scratch and claw with fervent desperation to stay on the road, but to what lengths are they willing to go to to avoid going back home? Anyone familiar with the previous work of Joseph Ridgwell will know exactly what to expect from Burrito Deluxe – a highly tuned and refined prose combined with excellent comic timing. The story zips along at break neck speed and you will find yourself laughing and crying from one page to the next. The character of Ronnie is an interesting one, the comparison of him being the Dean Moriarty to Joseph’s Sal Paradise is easy to make, but none the less an accurate one. Ronnie is very self assured, full of piss and vinegar, and the young Ridgwell will follow him to the end of the world. However, by the end of the novel you get the feeling that the characters have both evolved and that they are no longer necessarily heading down the same path. 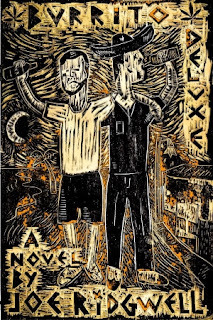 Burrito Deluxe is a highly entertaining road novel that will at the very least leave you with a severe case of wanderlust, and will hopefully garner Joseph Ridgwell the notoriety that his talent deserves. 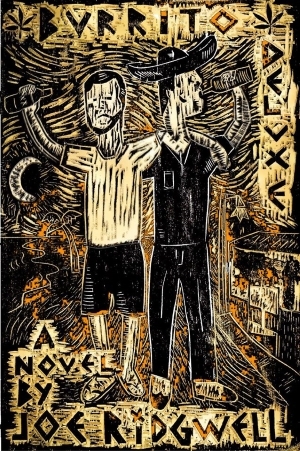 Special mention has to go to the astounding front cover design – A woodcut from Southern Californian artist Jose Arroyo – in my humble opinion never before has a cover so accurately captured the spirit and essence of a novel so perfectly. Viva la Mexico! The official book launch is happening tomorrow night in Leith, so if you're in the area you'd a be a fool to miss it. 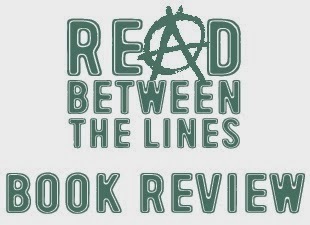 If not, you grab a copy online from Leamington Books.